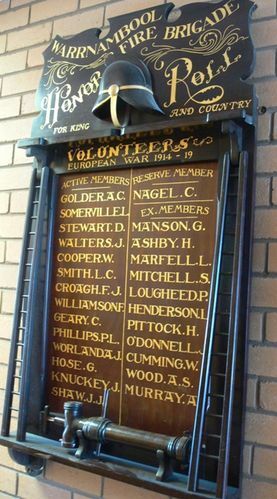 The Honour Roll commemorates Warrnambool Fire Brigade members and ex-members who served in World War One. The roll was originally unveiled in 1917 and contained 21 names with additional names being added at a later date. The fire brigade honor roll, bearing the names of twenty-one members and ex-members, of whom two have been killed in action, was unveiled on Thursday night in the presence of a large gathering, including members of the Country Fire Brigades Board, the mayor(Cr. Webb)and Mr. Deany M.L.A. The ceremony was performed by the president of the board, Mr. W. Wallace of Bendigo, who said that Warrnambool would be supplied with a motor fire reel within six months. Age (Melbourne), 28 April 1917. Note: The images were taken in 2013. A new fire station was opened in 2016 at 61 - 65 Mortlake Road. It is unknown if the honour roll has been relocated to these premises.